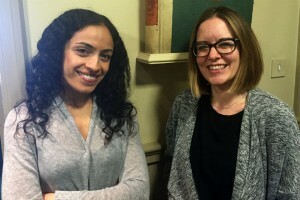 May El Komy and Nerissa Steel are jointly Head of Civil Society Research in the Cabinet Office, a role they have been sharing since November 2015. We asked them a few questions about their experience of job sharing. What made you decide to look for a job-share partner? May: I'd increasingly been hearing about job shares and was beginning to see job shares across the Civil Service. The more I found out about them, the more I thought they were a good thing, in offering part-time workers the opportunity to truly work part-time, and for the business to get the most out of part- time workers. Nerissa: I came back from maternity leave into a great new role with a supportive team. However, adjusting to being back at work with a sleepless baby and fitting a busy full-time job into 4 days was mentally and physically exhausting. I knew I couldn’t sustain that pattern of working so I found out all I could about the different options. I’d come across some great examples of successful job shares in the Cabinet Office and it seemed an ideal solution for me. How did you go about finding a partner? M: I used the Civil Service job-share finder, which is a really good place to start if you want to find out about the available pool of cross-government colleagues searching for a job share. I also signed up to some departmental mailing lists and attended a job-share speed networking event! N: Similar to May, I joined my department’s flexible working group. It was through this that I found out about the online tool and the speed networking events, which is how May and I reconnected (we had worked together several years before but lost touch). How has job sharing changed your life? M: I can switch off on my non-work days and I don't get the dreaded feeling on a Friday evening when I log off that there will be something that I've missed as, even if there is, Nerissa will come in on Monday and can pick it up again. Similarly, on my first working day of the week (Wednesday) everything that I've missed is wrapped up in a one-hour catch-up meeting that Nerissa and I have first thing, rather than a plethora of emails that are difficult to make sense of without context and background. Job sharing makes me feel more confident that I can do my job properly and be comfortable with my work/life balance. N: I agree with May. Being able to really mentally switch off from work on my days off has made a huge difference for me personally. I also no longer feel the guilt about not being there for my team on the days I’m not in the office, as I know May is, so I hope they have felt the benefit too. Finally, it’s given me back some of the capacity to progress some of the less time-bound strands of our work that previously were more likely to get lost in the day- to-day, which is good for the business as well as for our own job satisfaction. What advice would you give to those seeking a job share partner? M: 1.) Talk to other job sharers and get their thoughts on the benefits and challenges of a job share. 2) Think about what you really want in a job-share partner in terms of their skills, experience, personality, working hours, and so on. The things that matter will be different for everyone, but if there are things that you feel strongly about, it's important that you discuss these with any prospective job- share partners so that there is mutual respect and trust. 3.) Consult and seek feedback - once you know that you'll be working in a job share, talk to your prospective managers and staff so that you can address any concerns or issues they may have before the job share starts. And once the job share is in place, seek feedback to ensure that they feel it's working well and/or to suggest things that could be done differently to fine tune the way the share operates. N: I agree. Being open and honest with each other is particularly crucial. You have to be able to trust each other - your job share will get to know the professional you better than anyone, seeing the good and not so good! At times that can leave you feeling a bit exposed, but I’m also finding I’m learning much more about myself, which, in turn, is helping my own development. So I see it as a real positive.